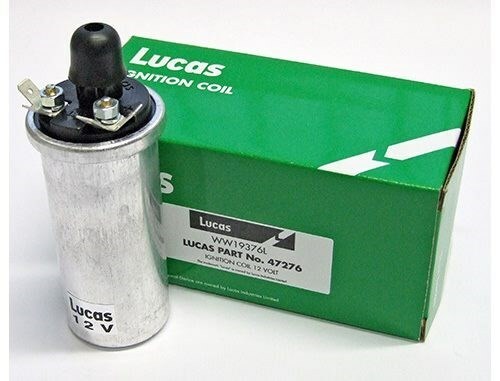 12 Volt Single Output Ignition Coil. As fitted to 12V British Singles and Twins with 12 volt electrics. For twins with Sure Fire/Altair electronic ignition systems, we recommend two 6 volt coils, or one 12 volt dual output coil (IC33/IC35). Diameter: 1 5/8" (41mm) approx. Overall length: 4 3/8" (111mm) approx. Body Length (to flange): 3.3" (84mm) approx. Flange diameter: 1.9" (48mm) approx. HT outlet length: 0.55" (14mm) approx.